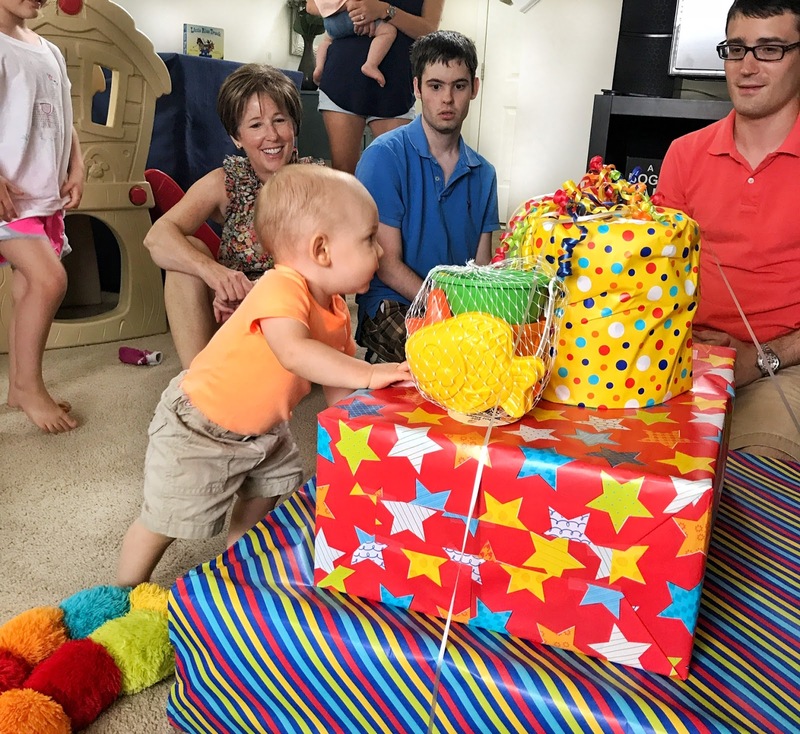 the cozy birdhouse: oliver turns one! Our little godson is one! 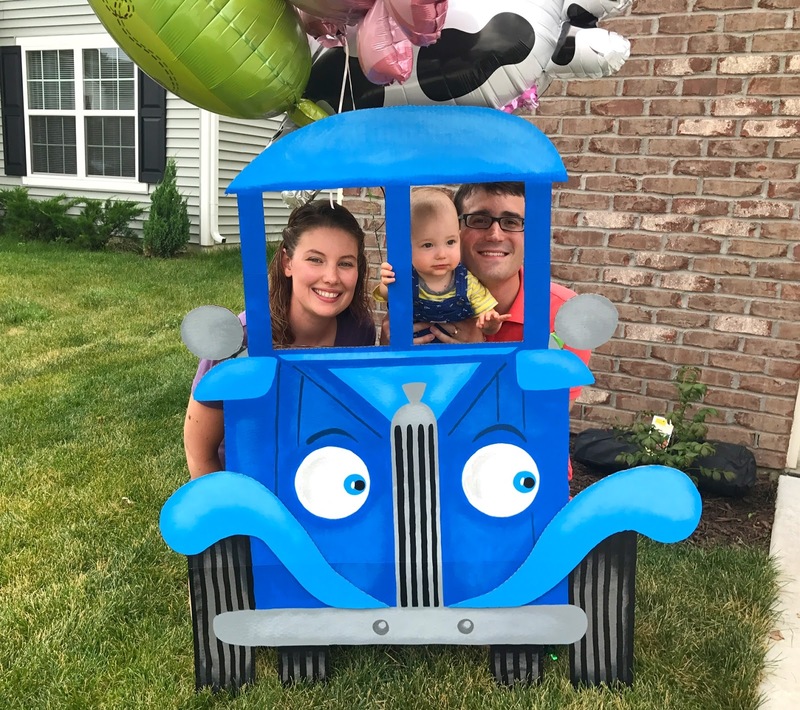 Last Saturday, Emily and Christopher threw a "Little Blue Truck" themed birthday bash for Oliver at their home. They had great weather and excellent turnout... and we had lots of fun! Oliver really got into the cake smash. 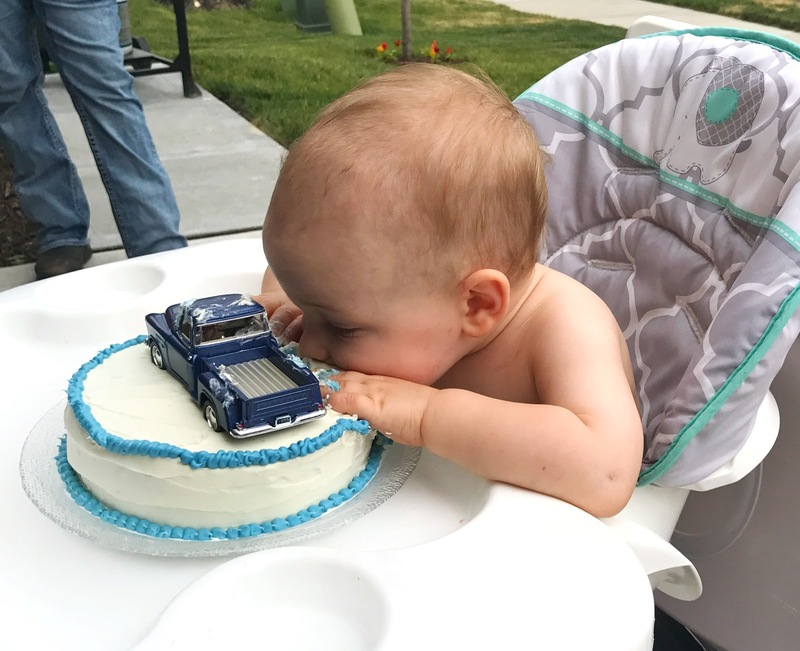 He had practiced a little during his one year photo shoot, but had devised a new technique for maximum cake consumption at his party. 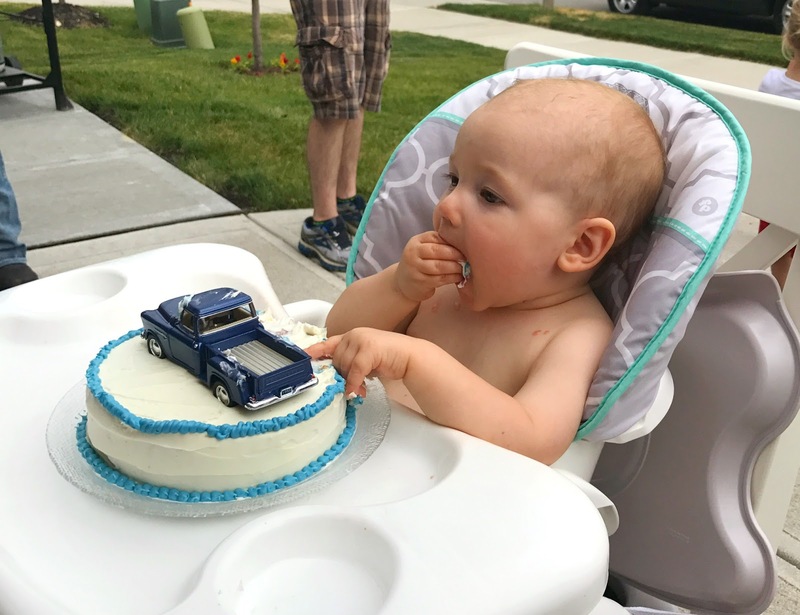 He started out by bringing the cake to his mouth in big fistfuls, but figured out that smooshing his face directly into the cake was more efficient. Ollie got lots of fun new presents including a slide, a water table, and a fancy blue coupe. All the kids were fighting over everything; I think Oliver is going to be one popular kid with all his fun toys! If you haven't read the book "The Little Blue Truck," it's about a friendly little pickup who helps a big dump truck out of a mud puddle with the assistance of some barnyard friends. Emily's party decorations were really cute; my favorite was the cornstarch/cocoa powder "mud" that was super fun to squish and play with. 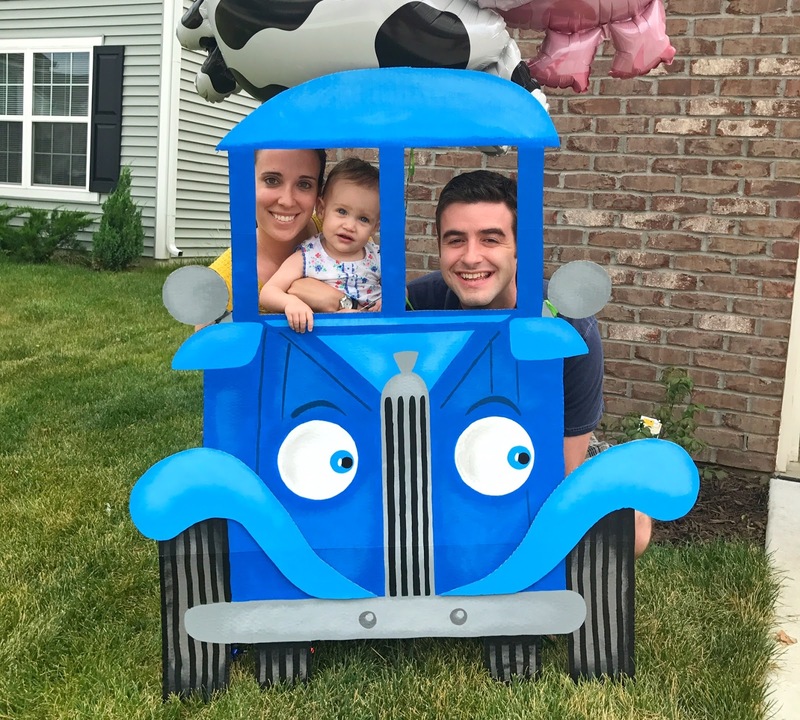 She asked me to make a truck photo booth after seeing one on Pinterest, and I had so much fun working on it! It's made from a science fair board, craft paint, and some wood trim to reinforce the back. 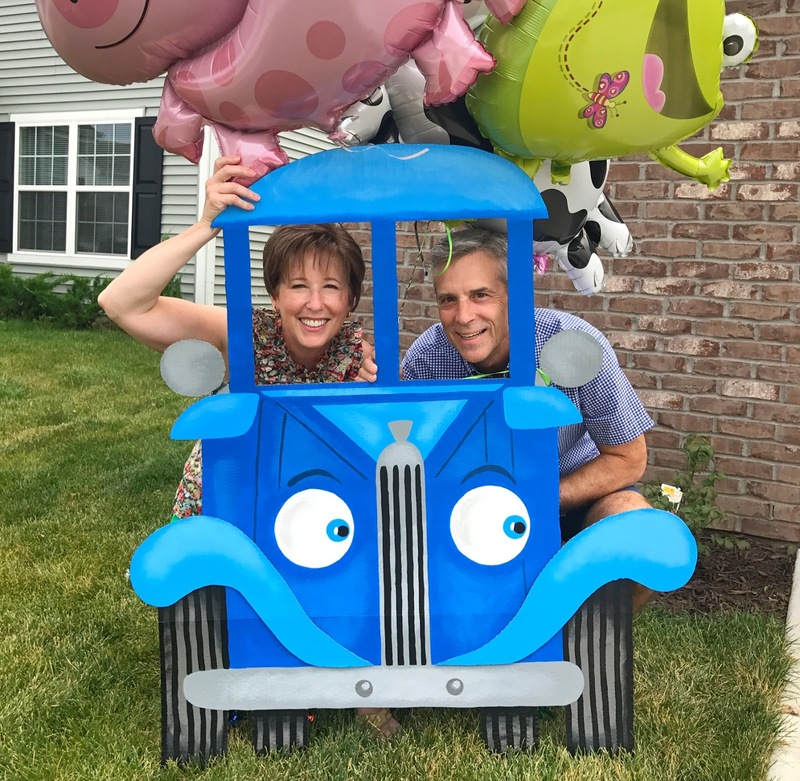 Emily bought balloons shaped like the cow, the pig, and the BIG GREEN TOAD! On Sunday (Oliver's actual birthday), we celebrated Father's Day for Dad, Dan, and Christopher, plus Emily's birthday and my birthday! I sewed Emily an apron from this super cute bird fabric I found at Joann, and of course I had to add teal ties for her. I bought the Sweet and Sassy Apron Pattern from Modern Vintage Designs on Etsy. The pattern had great instructions and was easy to follow. Happy Birthday, Emily!